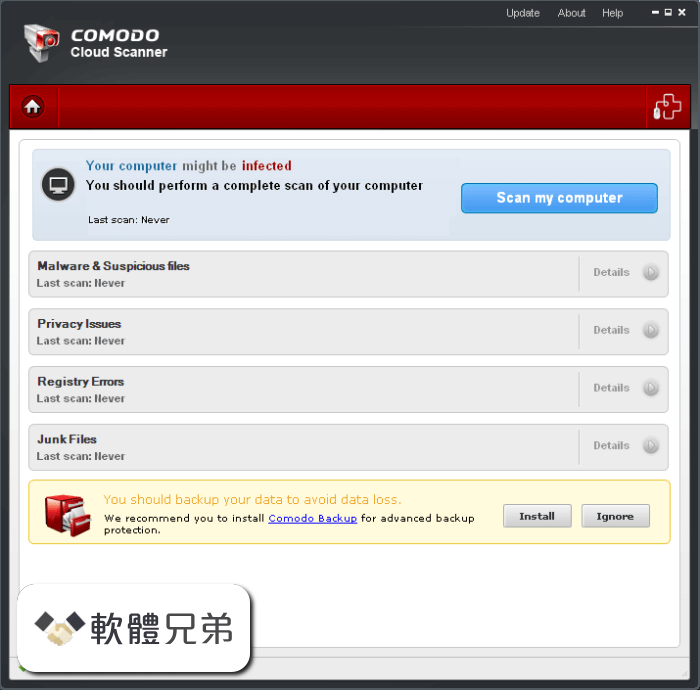 Comodo Cloud Scanner（CCS）是一個簡單而強大的 PC 系統掃描工具，可以快速準確地識別您的計算機中的惡意軟件，病毒，可疑進程和其他問題. Comodo Cloud Scanner 提供了一種非常快速的方式來查明您的計算機是否有病毒，根套件，蠕蟲，間諜軟件，廣告軟件，不受信任的進程或可疑的驅動程序和服務。除了使用本地安裝的受信任可執行文件白名單外，CCS 還使用實時文件查找服務來識別惡意軟件和可疑（不可信）文件。掃描儀也很棒，可以發現計算機上正在運行的任何隱藏進程。進程可能已經被惡意軟件啟動. 無論您何時執行任務（如安裝或刪除程序或修改計算機上的文件），Windows 都會在 Windows 註冊表中創建一個條目來反映此更改。隨著時間的推移，這些條目變得混亂，混亂，並放慢你的電腦。這是因為隨著註冊表大小的增長，Windows 需要花費越來越長的時間來查找和更新正在執行的新任務的條目。總之，你的系統變得緩慢而緩慢。雲掃描程序通過運行深入掃描來查找任何不必要或損壞的密鑰來識別 Windows 註冊表問題。清理註冊表後，Windows 將能夠更快速地從註冊表中訪問所需的信息 - 這意味著您的計算機將立即獲得性能和穩定性. 隨著您的磁盤驅動器變得雜亂無章，Internet 文件，日誌，不必要的檔案，未使用的圖標和重複的文件。這些垃圾文件佔用寶貴的硬盤空間，並可能對計算機的性能產生負面影響。示例包括由 Windows 創建的臨時文件，保留在回收站中的文件，Windows 日誌文件，臨時 Internet 文件，由 Office Suite 創建的臨時文件等。 CCS 將掃描您的系統，並確定所有您可以愉快地生活的文件. Windows 和其他流行軟件以臨時文件，歷史記錄，緩存文件，Cookie 和使用記錄的形式記錄您最近的活動。此數據表示潛在的安全威脅，因為它可能被黑客或其他使用您的計算機的人訪問。例如，任何有權訪問此信息的人都可以確切知道您正在處理的內容，訪問過哪些互聯網網站，並且可以閱讀您的即時通訊對話的完整記錄。 CCS 通過全面識別可能潛藏在互聯網瀏覽器，即時通訊客戶端以及其他許多應用程序中的個人數據痕跡，有助於保護您免遭身份盜用. - Files verification before submitted via CIMA. The files already submitted have quicker verdicts. - Files Checking FLS vs. CIMA. Either behind a proxy or in case of connection problems with one of our servers, now you can be sure that the other one will give you diagnostics. - Cloud scanning. Using our latest cloud technology to scan your computer with Comodo online services and tools. Cloud Scanner makes a real-time connection to Comodo's online database and it detects the very latest malware. - Hidden processes detection. Our tool detects processes that are hidden and could be dangerous to your system. - Fastest scanning engine. We use one of the fastest scanning engine, 30% faster than the previous one. - Detect junk files. Over time your disk becomes occupied by temporary internet files, unused icons and duplicate files. They can have a negative impact on the performance of your computer. They can be called junk files and are detected by Cloud Scanner. - Deeper scan in special folders (Windows and Program Files) for malware, from Malware & Suspicious section. - Custom Scan. Just by right clicking on your directories or process files, Windows Shell starts scanning for malware and suspicious files. Download Comodo Cloud Scanner. Cloud Scanner - detects malware, privacy issues and registry errors. Tải phiên bản 2.0.162151.21 phần mềm COMODO Cloud Scanner - Sửa lỗi registry và xóa file rác.